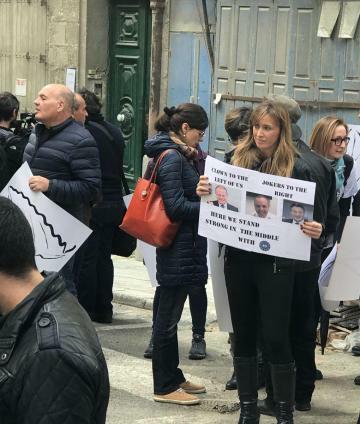 Activists calling for respect for the rule of law have gathered outside the European Parliament's Valletta offices, where an MEP delegation is due to hold a press conference at 1.30pm. Calling out "we want justice" and holding placards, activists from groups L-Awturi, Il-Kenniesa, Occupy Justice and V.U.C.I lined St Paul's Street ahead of the MEPs' arrival. 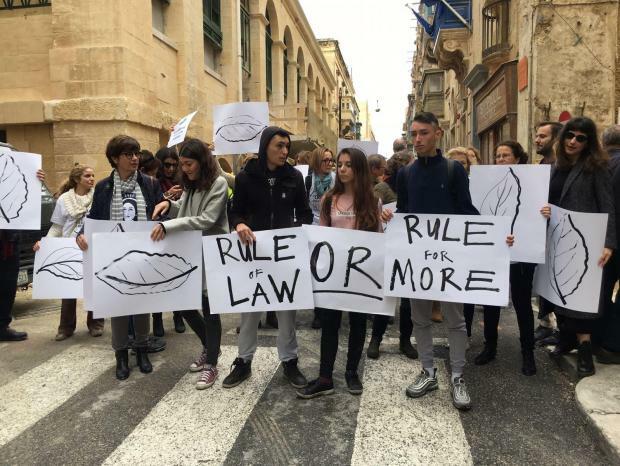 The groups say Malta is facing an "institutional crisis" with the rule of law in tatters and the government ignoring their demands. In a statement, the four activist groups reiterated calls for the police commissioner and attorney general to be removed and for appointment mechanisms for those roles to be changed. "Yesterday, we were given the opportunity to discuss with the European Committee our great concerns about the situation in our country," the activists said. "We trust they will deliver our message to the Prime Minister in the hope that he will finally listen and act." The six-person MEP delegation press conference will draw the curtain on a two-day fact-finding visit exploring rule of law concerns raised in the European Parliament last month. In the course of their visit, MEPs met with the Prime Minister, chief justice, police commissioner, regulatory authorities as well as journalists and civil society activists. The Prime Minister's chief of staff Keith Schembri also met with MEPs this morning following intense public pressure to do so, in a joint meeting with Prime Minister Joseph Muscat and Justice Minister Owen Bonnici.